It is our 5th night here at the Federal building in Los Angeles. After being frustrated and angry and doing a lot of venting, last Thursday we just grabbed a tent and came out here. We can at any time go home, so it’s not really taking a risk. It’s a bit uncomfortable, but shouldn’t we be willing get outside of our comfort zone, especially those of us doing anything related to this full-time? What’s been cool about being here is meeting others that were just waiting for the opportunity to get out and yell that what is happening in Darfur is not right, and they are willing to step outside of their comfortable world to make this statement. Emily is one of the dozens of people that have done activist shifts here. She left just a few minutes ago, well after 11pm. Emily (left) and Suzie, putting in the hours. 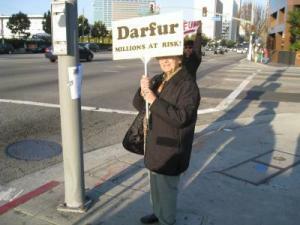 Who knew being an activist for Darfur could be so rewarding? I, Emily Berg, college student at Mount Saint Mary’s College in Los Angeles, have been “demonstrating” with others from the community who are passionate about the issues in Darfur. I’ve found that being out on the street has served a higher purpose for myself and those around me; the simple act of holding a sign will send a message to someone driving by that they, too, can make a difference. Today and tonight I’ve felt a change for the good. The good comes out in people organizing the events, people holding signs, people honking as they drive by and people who stop and ask questions. The beauty is in the simplicity of knowing that one person can, indeed, send a message. The person who’s example I followed was Brian Steidle in his film, “The Devil Came on Horseback”. Through his film he influenced me to come out and help, but little did I know that I would end up meeting him today. Words cannot express how much gratitude I feel towards the people who dedicate their lives to creating a better and safer world. The experience alone has created, within me, a force to be reckoned with. I am overjoyed I’ve been able to participate and cannot wait to be involved farther down the line! 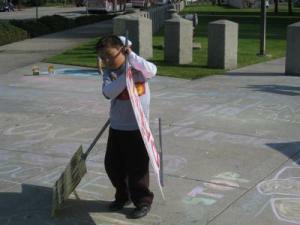 Little G, trying to do double activism at once. Brian Steidle talks with Gabriel about the situation in Darfur.